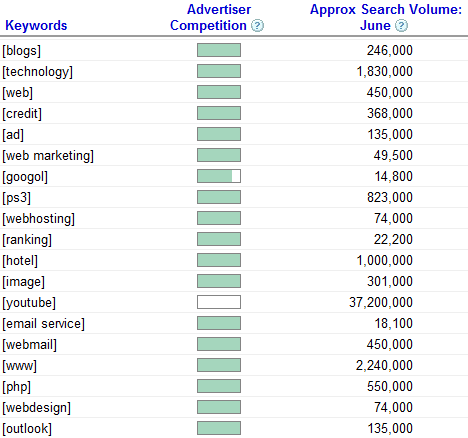 Google AdWords Keyword Tool started to display actual numbers for search volumes. The tool is useful to find related keywords for search ads, but it can now be used to find the number of searches in the previous month and average for the past 12 months. For more accurate results, you should select "exact" in the Match Type column and choose appropriate values for country and language. Google mentions that the values include the number of searches from the search network (sites like Ask.com, AOL, Netscape) and they're approximate. "These approximate numbers are intended to provide better insight into keywords' monthly and average search volumes than previously provided by the tool. (...) The Keyword Tool also provides several other keyword-related metrics that can help you select highly relevant keywords to improve the overall performance of your campaigns. You can easily view data on advertiser competition, search volume trends, estimated average CPCs, and estimated ad positions for keywords," mentions Inside AdWords blog. I was wondering if there are any visual infos on the net where is shown how many daily/weekly/monthly searches are done on google and yahoo. I do not care about keywords but the total searches every day in numbers. Can anyone show me a link, I was unable to find any numbers online. I think this is the best tool. I have used other keyword tools also but the data fetched from other tools has huge difference from this tool. I am already using this tool from a long time but sometimes feel that its not gives the true results. Because it does not show any search volume of a keyword which are very common. and can you tell me any other keyword tool like this.